It is appropriate that an international conference on "cold fusion," now called Low Energy Nuclear Reactions (LENR) is being held next month at Salt Lake City, Utah, to mark the twentieth anniversary of the historic Fleischmann-Pons University of Utah announcement which was first made there. It is obvious by now that experiments on this field have been repeated by several groups in the world and there is nothing fundamentally wrong with the observations. If the observed phenomena do not fit within our text-book understanding of nuclear phenomena, that is a problem for science to solve. Nature demonstrates many phenomena which we don't yet understand. This does not mean we should not explore further. The need to satisfy peer reviews, (in fact there could be no perfect peers at any time in any subject,) should not come in the way of continued exploration. We are glad that an archive is being created to mark this occasion. We congratulate Steven B. Krivit and New Energy Times for this initiative. 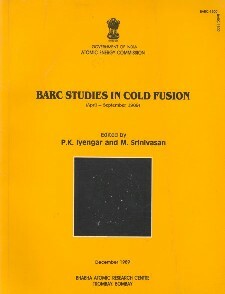 Early in April 1989 the Bhabha Atomic Research Centre (BARC), Mumbai, embarked on a massive experimental campaign involving close to 50 scientists to investigate whether there was any basis to the reported claims of occurrence of “fusion reactions” at room temperature in Pd-D2O electrolysis cells. Deuterium gas/plasma loaded titanium targets as well as nickel-light hydrogen electrolytic systems were also studied for nuclear debris. Within weeks the production of neutrons and tritium was confirmed in over a dozen independent experimental configurations, with neutron yield being almost eight orders of magnitude smaller than that of tritium. This so called “branching ratio anomaly” has since been identified as a unique signature of lenr devices by other groups around the world. Autoradiography of deuterium gas/plasma loaded cold working titanium metal targets indicated that tritium production occurs primarily in localized hot spots, predominantly defect sites created during machining of the electrodes/targets.